I found this exotic mushroom mix at our Sunday farmer's market this week. I thought this particular assortment was beautiful, and liked the combination of hearty shitake and king mushrooms and with delicate and subtle oyster and enoki mushrooms. I purchased 8 ounces for 5 dollars, which seemed just about right for two servings. 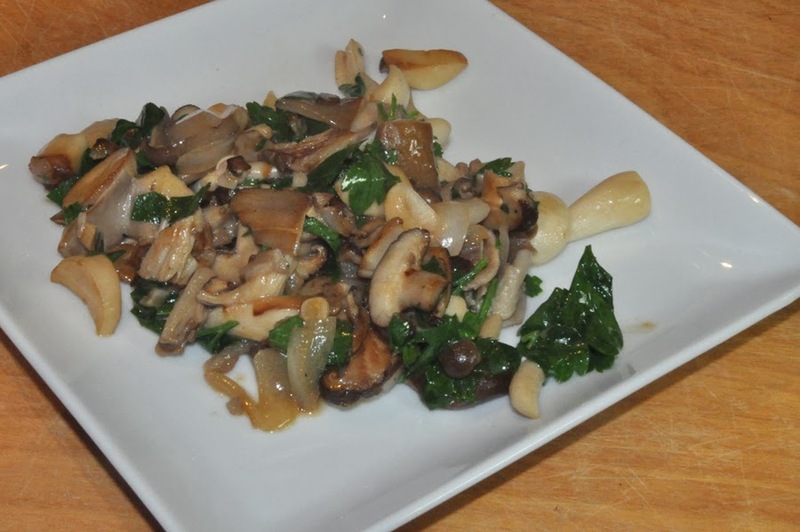 This recipe will easily double, and is perfectly amenable to whatever type of mushroom you happen to have, anything from brown cremini mushrooms, to whatever exotic type of mushroom you find. A word of caution, some of the exotics, especially porcini mushrooms, can creep up there in cost, so if you find a reasonably priced mixture at your farmer's market, go for it! I served this ragout over cheesy polenta, but it would be equally good over pasta, perhaps fresh pappardelle or gnocchi. If you don't feel like making your own polenta, pappardelle, or gnocchi, they're all available in the convenient, fresh section of your market. Cut the mushrooms by slicing the larger mushrooms. You want all the mushroom pieces about the same size, so some of the smaller mushrooms may be left whole. I cut the king mushroom into slices, then cut the slices into shorter pieces as they were so large. Heat the olive oil in a skillet, then add the sliced shallot and cook about 1 minute. Add the butter and the more substantial mushrooms and cook for another two to three minutes, then add the more delicate mushrooms and the wine or stock. Cook for an additional minute or two, until the liquid cooks down. Add the fresh herbs and pepper, then taste as you add salt. You may not need much salt is you use salted chicken stock. To cook the polenta. Mix the water with the cornmeal in a saucepan. You can find coarse cornmeal for polenta in many bulk food sections. Bring the mixture to a boil, then reduce to a simmer, cover and cook for about 5 minutes, stirring from time to time. The mixture will be quite thick. Stir in the cheeses. To serve, dish up some of the polenta, then top with some of the mushroom mixture. Top with the additional Parmesan cheese. Stealthy Cooking Tip: Holy Shitake Mushrooms! I'm tempted to call this recipe by that moniker, as I've been known to use that expression when things don't go quite right and little ears are nearby. However, this post contains more than one word of caution, as little mouths may repeat that phrase when you least expect it ... then what? Always good for a smile and a laugh.